A subtle and beautiful reminder of what’s important; Diversity is a gift! 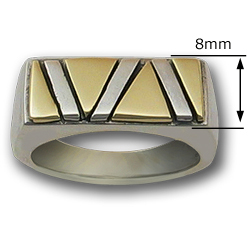 Our Sterling Silver and 14K Gold Pride Ring is just what you've been looking for. Handsome, simple and solid, it's total eye candy! Affirm ones self and the community as a whole!